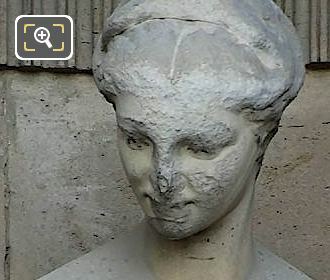 We took these high definition photos showing a statue called Litterature Satirique, which was sculpted by Roland Mathieu-Meusnier and can be found on the facade of the Musee du Louvre, in the 1st Arrondissement of Paris. 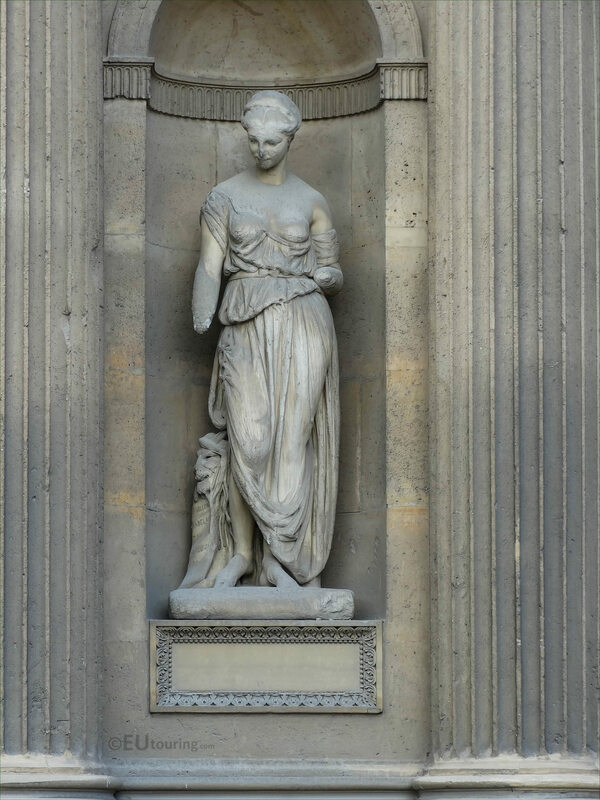 In this first HD photo you can see a marble statue located in a niche on a facade of the former Paiais du Louvre called Litterature Satirique, and in English this translates to Satirical Literature, which is basically a form of writing using humour, irony, sarcasm or ridicule in order to criticise things such as foolishness or corruption. 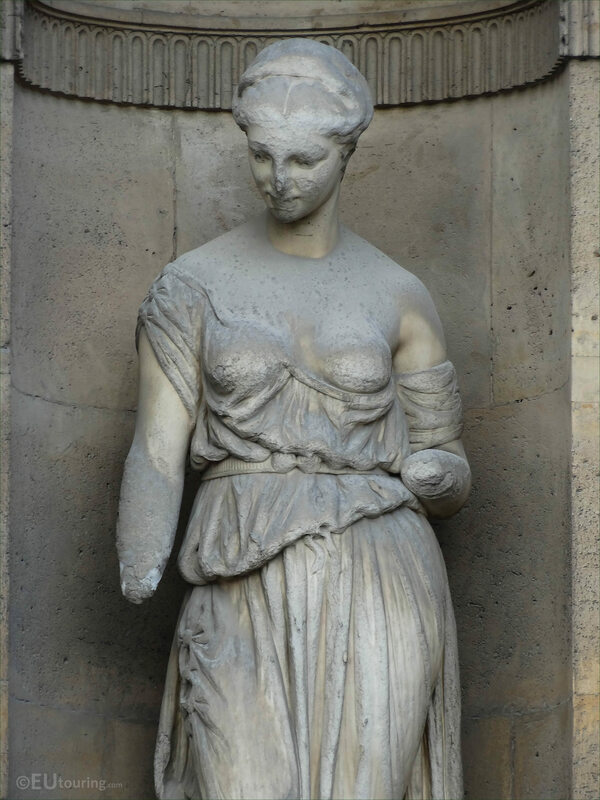 Here you can see a close up photograph showing the marble statue of Litterature Satirique and as you can tell, both of the hands are missing and it looks a little worse for wear, unless of course, this was how it was meant to be due to the title of this work. Now this was produced by Roland Mathieu-Meusnier who was born in Paris in 1824 and studied at the Ecole des Beaux Arts under Auguste Dumont, presenting his works at numerous Salons for French artists, and although he did sculpt full statues, many were portrait busts and medallions, which is what he became recognised for. Some of the works by Roland Mathieu-Meusnier are now within tourist attractions such as the Comedie Francaise, Chateau de Versailles, the Institut de France, Palais Garnier Opera House and the Musee d'Orsay, although you have this full statue of Satirical Literature on the Louvre Museum and another full statue group within the Jardin des Tuileries. 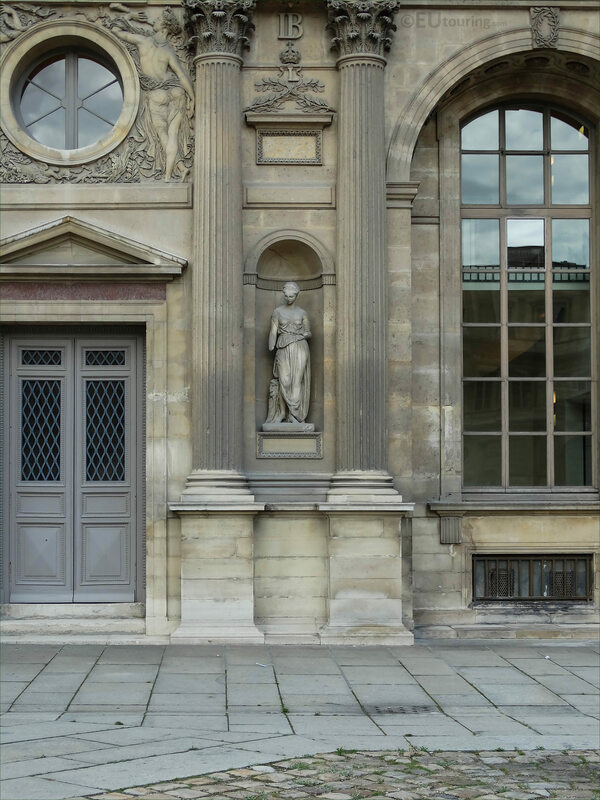 However, this image shows the location of Litterature Satirique positioned on the first level of the Aile Nord south facade of The Louvre, which can be seen from the Cour Carree, and when standing in this courtyard, the statue is eighth from the left hand side.